Two children among six flowering cups. There is a great deal of rich and complex symbolism in this card, but in a nutshell, it is a moment of innocent love, the boy and the girl both touching that one cup with the flower in it. He gets joy from giving it to her, and she gets joy in receiving it from him. 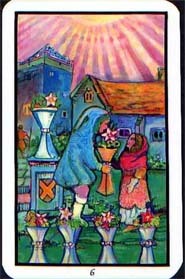 This card is most often viewed as nostalgia, of some old friend or thing coming back into our lives and letting us relive a happy moment from our past. The real meaning, however, is "joy," in particular, a known joy. This is the connection we make with someone (or something) who always makes us feel happy. They, in turn, get an equal measure of joy from making us happy. The joy we get is familiar and reliable. This might be gained by flipping through old photos and remembering happier times, chatting with a beloved family member, meeting with good friends for a drink, indulging in familiar foods, or enjoying the comfort of a favorite pair of slippers. As with all the sixes, this remarkable moment of happiness cannot last, no more than the children can stay innocent children. This known joy, like a bowl of chicken soup, can make everything right and better for the moment, but the querent should not rely on it as a miracle cure. This card can also warn that the querent is too attached to the "known," and afraid to experience anything new or unknown. They may be too reliant on old habits or too attached to an old lover. For this moment, however, the reader can tell the querent that this is what they need to restore emotional equilibrium: to connect with someone or something that they know will make them happy. Learn the Six of Cups tarot card meaning and the rest of the card meanings, symbols and stories in our eBook.